Seeking a fresh start, newly divorced Sarah and her daughter Elissa find the house of their dreams in a small, upscale, rural town. But when startling and unexplainable events begin to happen, Sarah and Elissa learn the town is in the shadows of a chilling secret. Years earlier, in the house next door, a daughter killed her parents in their beds and disappeared - leaving only a brother, Ryan, as the sole survivor. Against Sarah's wishes, Elissa begins a relationship with the reclusive Ryan - and the closer they get, the deeper they're all pulled into a mystery more dangerous than they ever imagined. A few months ago, I really enjoyed reading Lily Blake's Snow White & The Huntsman so I was looking forward to getting stuck into this book. Elissa Cassidy and her mother Sarah have moved to a new place away from the pressures of the city. Their new house is pretty big for the two of them and the only reason they can afford it is because the house across the way has a horrible history attached to it. The teenage girl who lived there was brain damaged and killed her parents. No one knows exactly what happened to Carrie Anne that night, but her disappearance has become a local urban legend. Now, Carrie Anne's brother Ryan lives in the house all by himself and is ostracized from the community because of his family's dark legacy. Elissa doesn't like the way the stuck up neighbours dismiss the poor guy because of something he had no control over. Especially when she finally meets him the night the 'cool kids' turn out to be anything but. In spite of her mother's objections she slowly develops a friendship with Ryan, who seems rather shy and sweet. Even if he does act a little strange sometimes and confuses the hell out of Elissa with his mood swings. I was hooked instantly, so engrossed that I didn't want to put it down. It's very well written, the characters are interesting, and it's got quite a few messed up surprises. But what I enjoyed the most was the heart of the story--the troubled relationship between mother and daughter. Elissa's a strong and stubborn teenager determined not to be prejudice and very much determined to be rebellious, which gets her into a whole lot of trouble. She's also still suffering from the effects of her father walking out on them and never looking back. Sarah's a mother struggling with finding herself while also raising a daughter after making a bunch of mistakes along the way. They both want the same thing but neither seems to know how to get there, and I enjoyed their separate journeys coming together in their darkest hour. 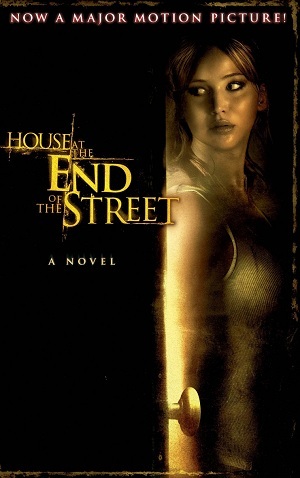 House at the End of the Street is a super creepy story with a killer twist. It's quite the page-turner and keeps the reader guessing. It's a great thriller, sprinkled with a good dose of horror-filled tension. I really enjoyed this book and can't wait to see the movie!